“I am a little nostalgic when it comes to architecture. Indigenous cultures, their crafts, and building processes fascinate me. There is just something about the handcrafted traditions- the constant connection to materials and their properties- that are so instructive …and beautiful”. Exclaimed Shani Chambers. Like many West Indians, Chambers’ parents were hard-working individuals who provided a strong foundation so that their five children could be educated and have opportunities beyond their homeland. Born in St. Andrew, Jamaica, Chambers attributes her architectural influences to Renzo Piano, Gottfried Semper, and Nicholas Grimshaw. These are perhaps a few designers whose work she admires and considers innovative in their thought and practice of building. The common thread to their work is the studied approach to design through materials and craft-making. “There are always lessons for me here”. For Chambers, her first conscious thought of building design was through the extensions to her family home. She remembers being surprised by her father’s hand drawings and watching the process of building what he had envisioned. As a 6-year-old these were exciting times for Chambers. All the sights, sounds and smells of construction were there to tantalize and open her mind to a career in architecture. Many years later, Chambers enrolled in the architecture program at the University of Technology in Jamaica. The diverse faculty imparted a wealth of knowledge and experience and cultivated the desire to explore her design interests, which at that time were (and still are) outside of traditional practice. 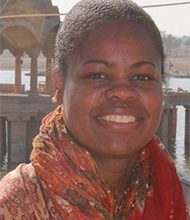 Chambers attended graduate school at Florida A & M University in Tallahassee FL and there she found a great support for the research that she would later pursue in academia. Chambers describes her mother as another strong influence in her professional development and success. Her mom’s continuous support throughout graduate school and her career have been unwavering. “She inspires me to persist in spite of roadblocks. As far as life lessons go that is a real currency for a young woman embarking on her life’s journey in a foreign country”. When asked about combating economic struggles, Chambers explains the importance of maintaining a great support system and following her dream. Even when times get tough Chambers could always be uplifted by flowing ideas. “I have found that where there are passion and persistence an opportunity would present itself or we create them”. Continuing to develop and expand on skills is important to stay current and marketable, shared Chambers. Her words of encouragement to any young professionals are that “you should never go stagnant, always learn something”. Many architects and designers seek alternative routes to practice as they wait for the ‘tide to turn’. Friends and colleagues of Chambers have started non-profits, became graphic designers and writers, went into product sales and furniture-making, and even became community advocates and animators; essentially developing new skill sets they may not have in traditional practice. “In effect, any downtime we experience are opportunities to explore other creative outlets which we may not have had time to do”, Chambers adds. Nowadays, having a hybrid career is beneficial, where you are sustained through having diverse skill sets and tapping into them as circumstances necessitate. Having one foot in academia and another in practice has been in part the source of Chambers’ sustenance both creatively and financially. She has also found opportunities in the entertainment industry and worked with artists on a few projects. “It is important to find out what is a good fit with your interests and background, this could open up new creative opportunities”. “Resolving what I have done in practice and academia has been a challenge for me”. The majority of Chambers’ experience in practice has been in hospitality, entertainment, commercial and federal arenas. 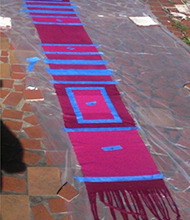 Her research investigates the connections between textiles and architecture. 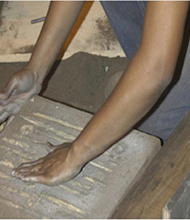 Here she uses her courses as laboratories for exploring the application of fiber and textile technology in building. It is rather experimental. In choosing projects to share with the Blacklines of Design audience, Chambers discusses her experiments with different materials. She enjoys working with her hands. Whether working with metal or fibers, she is always able to uncover something new through the creative process. While working in an office does provide its own satisfaction, Chambers feels disconnected from the building process. Here, in her own work, she is totally engaged and has autonomy on the outcome. 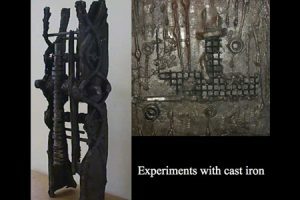 Each time she weaves or works with metal Chambers tries to challenge what she knows by creating new outcomes. Currently, Chambers is experimenting with rug weaving. 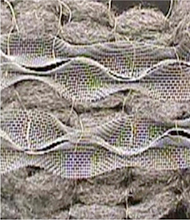 While in general weaving is labor intensive, the end product is often determined by the techniques and materials used. Here, very sturdy rug wool provides the structure for more colorful surface play. Textiles and their construction – spinning, weaving, felting quilting – are great analogies for architectural design and it is difficult to have passed through an architecture program without having been engaged these concepts. Chambers has gained a greater appreciation for color, scale, texture, function, and pattern. She realizes she is more sensitive to this when she designs or looks at buildings. Often the results of Chambers’ own experiments are the basis of workshops in teaching. 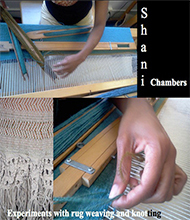 She introduces students to basic spinning and weaving techniques in addition to theory and research. The goal of these courses is to encourage students to have a greater connection to the materials they use in the design and to incorporate this understanding in their academic and professional framework. According to Chambers, a huge positive to the Blacklines of Design publication is that it exposes grassroots talent from the West Indies and beyond. “We do not often get to see ourselves succeed and sometimes we become lost in the crowd that is mainstream. We easily forget that our backgrounds can produce something positive and at any scale, architecture can be studied and uniquely applied”. Chambers’ has become more aware of the applicability of our backgrounds outside of traditional practice and finds this very exciting. Education is an important part of Chambers career and she enjoys opportunities to encourage young students to pursue their dreams. Apart from academic pursuits, she’s participated in various activities that promote diversity in Architecture. Career day, architecture workshops, mentorship, scholarships, and student competitions are some of the ways in which she stays connected and give back. It is a great experience to engage young minds and to be a source of support and encouragement- seeing them grow and excel is especially rewarding. Chambers thinks it is very important for us to stay focused on the big picture as women. Career goals, knowing your talents, continuously developing your craft and being the best at what you do are elements that are more or less in your control. There will always be challenges in the work environment but talents and experience are like currency. Being vocal about your goals and the areas you hope to contribute in is also important as people tend to respond favorably when you have a plan and follow through with it. Some of Chambers’ architectural organizational affiliations include the National Organization of Minority Architects (NOMA) and Atlanta Center for Creative Inquiry (ACCI).